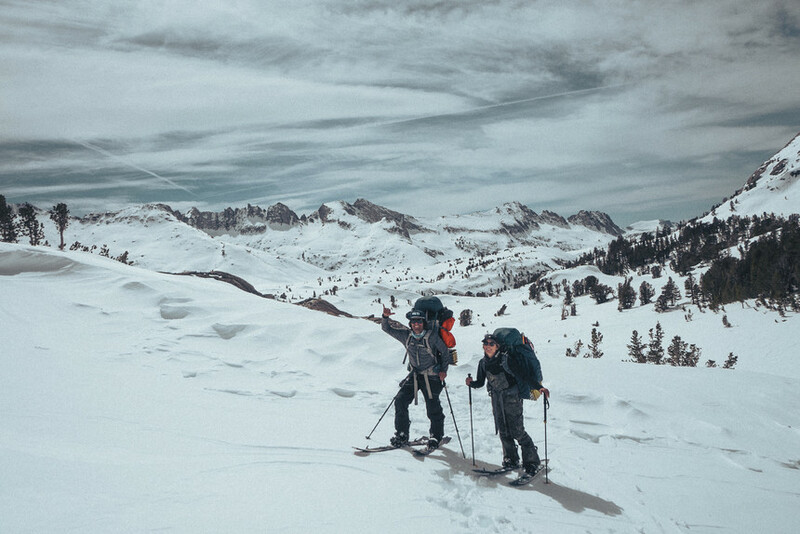 Editor's Note: Last spring big-mountain snowboarding legend Jeremy Jones set out with two-time Olympian Elena Hight on an ambitious foot-powered expedition across California’s John Muir Wilderness. Jeremy documented the journey in a travel journal that recounts their nine-day mission. What follows is his entry from the day 2 of filming for Ode To Muir with photos and videos he captured along the way. Backcountry snowboarder Jeremy Jones and two-time Olympic champion Elena Hight spent nine days splitboarding across the High Sierras. Too tired to write, but too good of a day not to. It was a day to tell my grandkids about; a day that will undoubtedly overtake memory space in my brain for eternity. At my feet the North Couloir perfectly splits Red Slate. A Sierra glory line due to its size and consistent pitch that holds its angle from top to bottom. This morning we opted for an upper side entry, which proved to be a good addition. The North Couloir of Red Slate. As I rounded the corner into the main vein, the moment took over. The turns got bigger, faster, and any plan of stopping mid chute went out the window. Soon I was coming out the bottom at top speed holding on for dear life. Uncontrollable yelling took over as I rolled to a stop and fell to my knees, doubled over, screaming and gasping for breath. A White moment. My first in some time and something I was not expecting 60 seconds earlier when I rolled into the line. Jeremy shows Elena the ropes of winter camping. Nick Kalisz photo. Back at camp we refuel and load our heavy packs with unneeded gear to be shuttled to the upper saddle to lighten tomorrow’s load for when we head west. After 2 hours of climbing the ridge is gained and we are rewarded with our first proper view of the the western skyline where we hope to go tomorrow. 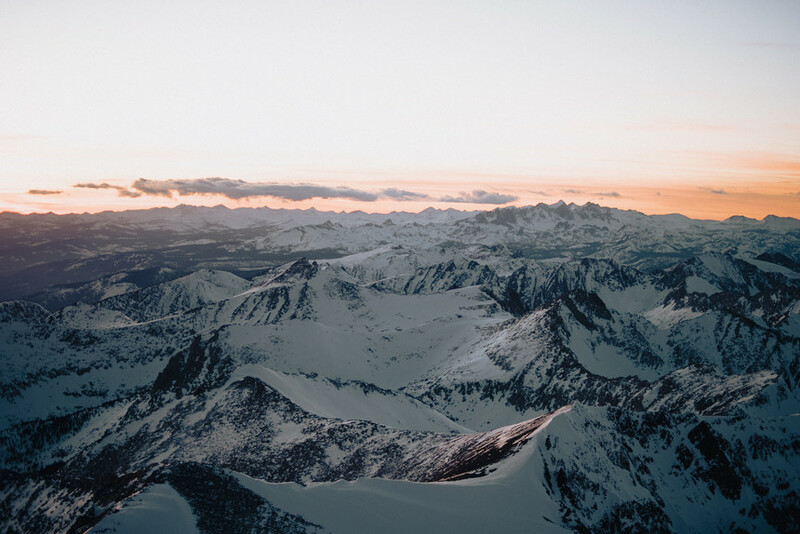 We have no real destination and our eyes work fast to try and digest the sea of fresh peaks but the light is waning and we need to keep moving up the peak. Our gear is stashed on the west ridge for the night. Upward we go working the endless west ridge that has one false summit after another. 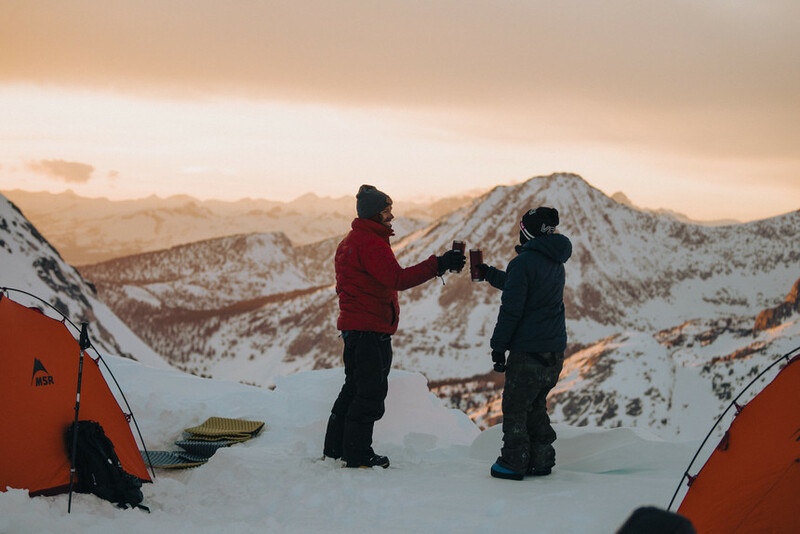 Cheers to a long hard day of bagging peaks and chasing turns. Finally, I see Schnider on the highest point. A few feet above him the full moon is on the rise and seems proportionally over sized. We are on the highest peak as far as we can see. Too much to look at, too little time. Red turns to violet, smooth, soft colors tilting into the purple hues on the West face - sacred land at a sacred time of day. As the day fades to night, we realize we are probably the last people in America to see the sunset. Elena leads the way back to camp. The glow seems to last forever. The Western sky now fluorescent with black jagged peaks poking into it. No wind, no noise, complete solitude – perfection. The sun finally leaves the stage after a rip-roaring encore, but it is now the moon’s turn to take center stage. It rules the show, lighting all the land just as the sun darkens it. We ride under the moonlight without headlamps – the best snow of the day. Rolling, hooting, gliding side by side on and on we glide in the massive bowl. Ten minutes later, we are back at camp, speechless from the Red Slate Double down. This Is really good. I like your blog very much. I want to write article /blogs like you how can I write please tell me. Get Happy New Year 2019 Funny Captions, Memes, Wishes, Quotes here. Thank you for sharing this post. I am very interested in journal. I would like to share my opinion on journal.best economical treadmill for home Victims of osteoporosis generally see such fractures within the hip and backbone. Accidents in these areas of the physique significantly have an effect on their well being and health stage.